Pro-Unity Spaniards March with Facetious Movement in Barcelona - Integration Through Media ....! 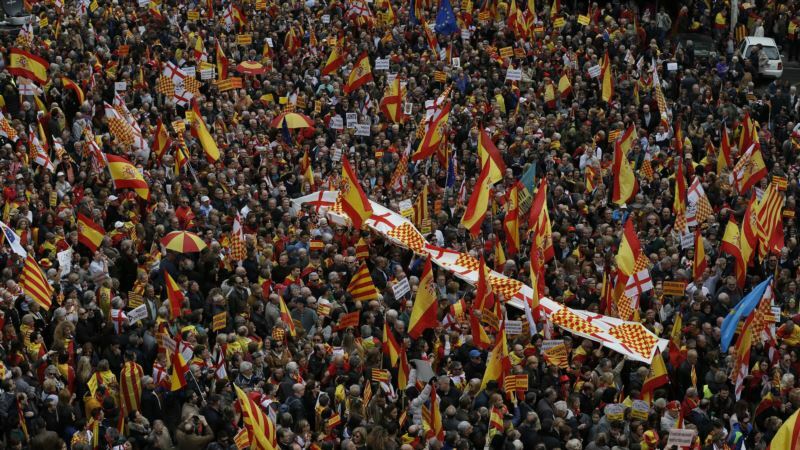 (VOA): Thousands of Spaniards for unity marched Sunday in Barcelona in support of a grassroots group that mocks Catalonia's separatist movement. The group, “Platform for Tabarnia,” facetiously calls for the secession of the cities of Barcelona and Tarragona from Catalonia – allowing them to remain in Spain as the rest of Catalonia calls for secession. Under the slogan “the joke is over — long live Tabarnia,” as many as 15,000 pro-unity Spaniards waving flags of Spain and the fictitious Tabarnia took to Barcelona streets. Political unrest has rocked Catalonia since it unsuccessfully tried to secede from Spain in September.Independence parties maintained a slim majority in the state following December elections, but leader Carles Puigdemont is exiled in Brussels, while other former leaders are in jail.